It’s time to make your money work for you! Managing your money effectively takes the right accounts and the right strategy. People often don’t take the time to make sure their financial institution and basic accounts meet their needs. But doing so can help you achieve stability faster so you can reach your goals. With that in mind, Consolidated Credit has put together this series of free money management resources. They can help you understand the difference between credit unions and banks and give you a roadmap for choosing the right accounts and help you avoid common money mistakes that lead to added costs and debt. If you have any questions, just hit the Ask a Question button at the bottom of the page to get more information from our certified financial coaches. Your financial institution plays a key role in how easy (or hard) it is to manage your money. Some people prefer the convenience and cutting-edge technology of a bank, while others prefer the personal touch of a credit union. 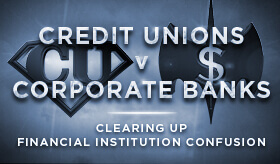 This infographic weighs compares credit unions vs. banks side-by-side so you can choose the right financial institution to fit your needs. Self-Help Guide: Do you know these banking basics? Roughly 12 million Americans are “unbanked” or “underbanked” – meaning that they don’t have the basic accounts necessary to manage their money effectively day-to-day. This guide teaches you about the basic accounts you need and how to use those accounts to your advantage. Choosing the right accounts and financial tools can help you avoid fees and grow your savings faster. This video teaches you Penny Wise ways to save money using your money and tells you how to avoid Pound Foolish choices that can lead to higher costs. Simple Savings Calculator: See how much you can save! Want to know how much growth a savings account or investment product will give you? This free simple savings calculator allows you to see how different rates and contribution amounts can make an impact on how quickly you can save. If you have questions about how to manage your money effectively, ask our team of certified financial coaches to get the answers you need to be successful.